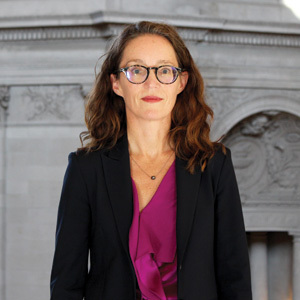 SAN FRANCISCO (Sept. 14, 2017) — City Attorney Dennis Herrera today announced that veteran prosecutor Keslie Stewart has joined the San Francisco City Attorney’s Office as Head Attorney of the Public Integrity Unit, where she will oversee all of the office’s investigations involving government ethics, contracting fraud, city employee misconduct and similar cases. Stewart served in the U.S. Attorney’s Office for 12 years, where she rose from an Assistant U.S. Attorney to Chief of the Oakland Branch Office. As head of that office, she supervised the intake and investigation of cases referred by more than a dozen federal agencies, including the FBI and IRS. She has investigated, charged and resolved cases ranging from investment fraud to arson to narcotics trafficking. Stewart also coordinated the handling of health care fraud allegations brought by whistleblowers, and represented the U.S. Attorney’s Office in presentations about best practices for searching and producing electronically stored information. Before joining the U.S. Attorney’s Office, Stewart was a trial attorney in the U.S. Department of Justice’s Antitrust Division, where she prosecuted price manipulation cases from California’s 2000-2001 energy crisis. Stewart succeeds David Pfeifer as the head of the Public Integrity Unit after Pfeifer retired. Stewart earned her bachelor’s degree from the University of California at Berkeley and her J.D. from Berkeley’s Boalt Hall School of Law. She was admitted to the California bar in 1996.